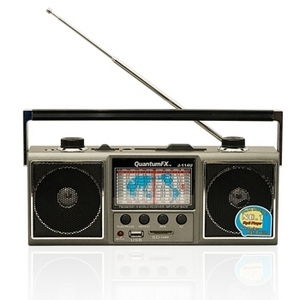 The Quantum FX J-114U is an analog portable shortwave radio with USB and SD card player support. As with other Quantum radios, there is very little information available regarding the technical specifications. So far, this radio is only available via eBay (see link below) and Amazon.com. Click here to find the Quantum FX J-114U on eBay. This entry was posted in Portables, Quantum and tagged Portables, Quantum, Quantum FX J-114U, Quantum J-114U, Quantum Shortwave Radio. Bookmark the permalink.